Why Bother Using The Word Cured? Cured. The only thing a person wants to hear after being told they have cancer. And it should be that simple. You get a cold. Take some meds. You recover. Broken bone. Gets set. Heals. 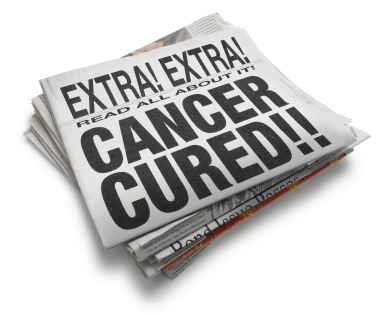 But why is it such a problem to nail down the word “cure” when it comes to cancer? I can only speak from the diagnosis of Hodgkin’s Lymphoma. I have no idea if patients of other cancers are given the same speech that we as HD survivors are given. So, that should mean that I am cured, right? But why would he not just say that I am cured at that point? I was willing to go along with just saying “remission” for five years. Why could I not say I was cured once I hit the 5-year mark? I want to use the word “cured” dammit! My signature of emails that I communicate to other cancer patients, includes the words “in remission”. I used to use the word “cured”, but unfortunately, I knew too many who had either relapsed or developed new disease. Which is not to say, that either is extremely common to occur, but rather, as people only reach out when a need arises, the percentage of people who fall into this category is still much lower than those who do not relapse or develop new disease. In November of 1988, I was diagnosed. I began radiation treatments for what I believed I was staged at 2a. At the completion of those treatments, I was told I was in remission. By June, I was dealing with Hodgkin’s again, but now staged at 3b. I had disease below my abdomen which either was not noticed before, or had been there all along. Doctors did not say if it was new, or did I relapse. It did not matter. I underwent chemotherapy. Again, I was told I was in remission. And so I waited. Month to month. Year to year. Hoping to reach that five year mark, so I could use the word “cured”. I want to say everything was laid out to me as far as concerns: relapse, new disease, secondary cancers, and for the moment, at least the next ten years, this was all I thought about, unaware of just what was developing in my body as a result of being exposed to over 4000 grays of ionized radiation (trust me, this is bad, look it up, and I actually know people who had higher exposure), and toxic treatments using drugs such as Mustargen, Bleomyacin, and Adriamyacin (again, look up to what doctors now know about how bad these treatments are, especially in the long term). As each year went on, and another year I got to hear “still in remission,” my anxiety about a relapse began to lessen. And yes, once I hit the 5-year mark, it disappeared. And so did I. My doctors no longer had any need to follow me up anymore. I used the word “cured”. Why would I not? I am approaching my 28th year cancer free next month. Why can’t I use the word “cured?” So what would it be called if Hodgkin’s came back? New disease? A relapse? I suppose it would all depend on the cell structure and typing, if it was identical to the pathology from thirty years ago, probably a relapse. But if a different pathology, then new disease. And what about the secondary cancer? While fingers would point to my HD history as an increasing factor, at the very least, they physiological change to my body and its immune system as a result of all the trauma and treatments would at least give me understanding as to why. Of course, as I have frequently posted here, I have more than a dozen diagnosis related to my Hodgkin’s history that I became all too aware of back in 2008 with the need for life saving open heart surgery. But at no time, was I ever fearful of my Hodgkin’s coming back. That is, until 2010. Dr.: I have good news and bad news. The good news is, your Hodgkin’s is not back. The bad news is that you have a 6mm kidney stone. I had to do a double take. Did he just say my “Hodgkin’s is not back?” Of course it is not back. It has been 20 years, why would it? But here I was, in my reality. That even after all this time, the first thing that will be looked at with my history, is the possibility of my Hodgkin’s being back. I have seen so many different interpretations of this consideration, cured or remission. I guess it is all about how you want to look and consider it. But as one fellow survivor pointed out, for many of my survivors, they may be blessed without having gotten knocked to the floor with a late developing side effect, or at least, be oblivious as to why their body is doing or acting a certain way, or as many of us have found out, better to know and understand why, and how to adjust so as to at least slow down a process (it cannot be reversed) that will always progress and worsen. I am not saying there is no future at all. But at least knowing my health issues, and how to treat and or prevent episodes has made a huge difference in the quality of life. And yes, that kidney stone was bad news. I wrote about it a long time ago. Check out “Birth Of A Kidney Stone” in my “pages” section of the blog. So yes, even after all this time, because it has never ended, I use the word remission. And I am okay with that. Thank you for sharing your journey in a direct, forthright way. It’s one of the very few that nearly parallels my own.